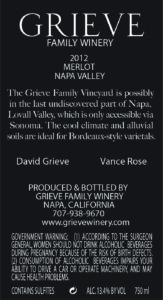 Our Grieve Family Vineyard, located in the heart of Lovall Valley, was planted to both Merlot and Sauvignon Blanc in 2000. 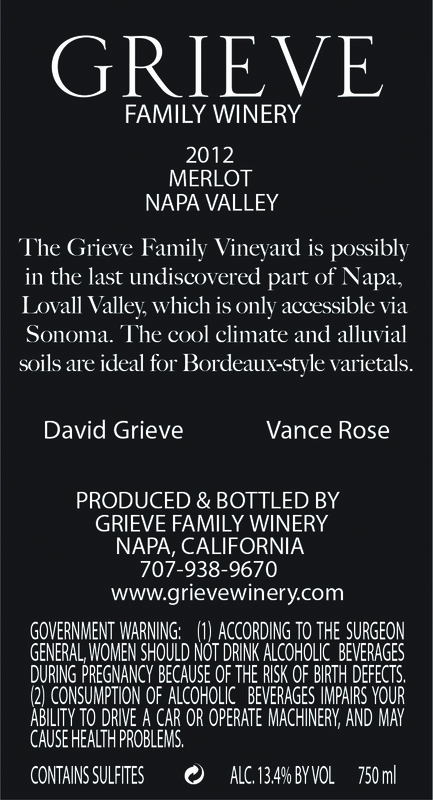 Lovall Valley is the coolest viticultural area in Napa County and sits just above Carneros, between the towns of Sonoma and Napa, straddling the Napa/Sonoma county line. Since the inaugural release of our 2006 Double Eagle, we have incorporated all of the Merlot we grow into the Double Eagle blend. For the very first time in 2012, we held back six barrels from that blend and bottled it as our first estate Merlot under the Grieve label. The 2012 vintage was a special one, being the first warm year since 2007. The spring began relatively dry,continuing with a warm spring that reduced the fruit set, resulting in a very small and concentrated crop. The summer progressed with July being a bit hot and August a bit cool, but things continued beautifully in September and October, giving us well-balanced and mature fruit. We picked beautifully clean, ripe bunches on the very cool morning of October 18, sorted in the field and then used a new electronic sorting devise in the winery that sorts individual berries. This gave us the most wonderful peasized Merlot berries that looked like black pearls! After a five-day cold soak in tank, fermentation proceeded naturally and lasted for 20 days, before we pressed the wine into barrels. Malolactic fermentation was allowed to occur naturally, as well, and the wine stayed in the original six barrels with only two rackings during 17 months aging. This extended contact with the lees gives the wine greater depth and flavor. The wine has a deep black/garnet core with a purple rim. The aromas are of plum, dust, orange zest and vanilla; the wine has an amazing brightness, with the acidity carrying the lingering flavors of cassis, plum, pine and cocoa. The wine is not overly powerful, yet is full of flavor intensity with an astonishingly long, bright and savory finish. Showing exceptional balance, our first estate Merlot is a pleasure to enjoy now and will continue to improve for years to come. The aromas are of plum, dust, orange zest and vanilla; the wine has an amazing brightness, with the acidity carrying cassis, plum, pine and cocoa flavors. The wine is not overly powerful, yet is intense with a long, bright and savory finish.